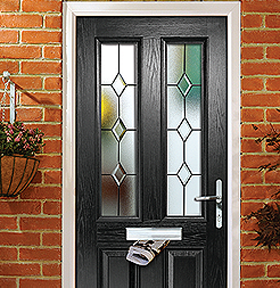 Sear and Cowen Glass & Glazing Ltd offer a wide selection of exterior composite doors. These GRP front and rear doors offer the charming appearance of a traditional wooden door whilst enhanced with the high security multi point locking systems of a modern uPVC door. Our composite doors bridge the gap between traditional wooden doors and modern uPVC doors. Your new composite door will be the focal point of your property, creating the perfect first impression for your visitors. Wood grain GRP skin offering traditional timber appearance and texture. Low maintenance, wipe clean surfaces. High resistance to warping, denting and bowing, provided by GRP skin. High security multi point locking. Up to 6 times greater thermal efficiency than a traditional wooden door. Sear & Cowen Glass & Glazing Ltd. FENSA Registration number 29946.